The following manuals make up a series of publications developed by the CMPA, designed to assist owners, employees and others associated with the material processing industry. The Work Safely Reference Manual (WSRM) is the support material provided for the Certificate II in Extractive Industries mandatory unit of competency Work Safely. This reference manual provides general information to site managers, employees, subcontractors and suppliers so that they can perform their work safely. The Preferred Suppliers & General Information Reference Manual is produced annually and distributed to over 330 industry personnel around Victoria. This publication categorises Associate Members into their supplier groupings, providing Voting Members and industry employees with a reliable resource of CMPA preferred suppliers, when searching for particular goods and services. The Conduct Crushing Reference Manual is the support material provided for the Certificate II in Extractive Industries elective unit of competency Conduct Crushing Plant Operations. This reference manual provides specific information on the planning and preparation for operations; the operation and post operational procedures of fixed and mobile crushing plant. 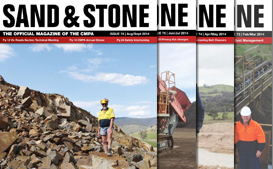 This is essential reference material for each quarry operation and should be available for plant operators to refresh and increase their knowledge. A summary of the manual’s content is available here. The Conduct Screening Reference Manual is the support material provided for the Certificate II in Extractive Industries elective unit of competency Conduct Screening Plant Operations. 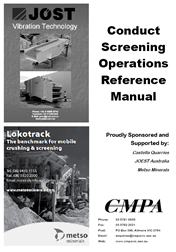 This reference manual provides specific information on the planning and preparation for operations; the operation and post operational procedures of fixed and mobile screening plant. 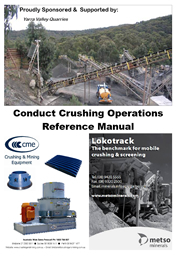 The Crushing & Screening Reference Manual is the support material provided for the Certificate II in Extractive Industries elective unit of competency Conduct Crushing & Screening Plant Operations. This reference manual provides specific information on the planning and preparation for operations; the operation and post operational procedures of fixed crushing and screening plant. This reference manual provides specific information on collecting samples at field or production sites using specified equipment and standard or routine procedures. This reference manual meets the requirements of the unit of competency “Cut, Weld and Bend Materials” (RIISAM205A) from the Certificate II in Extractive Industries Training Package. acceptability of raw and/or manufactured construction materials. Training resource for unit of competency from MSL09 Laboratory Operations Training Package being: MSL973010A – Conduct laboratory-based acceptance tests for construction materials. 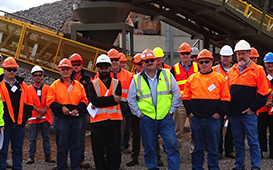 scheduled, periodic service and maintenance of crushers. service and maintenance, and key tasks. The CMPA welcomes all comments, so if you find that there is something missing, please click here to contact the CMPA.